A person will not believe what they can’t imagine. 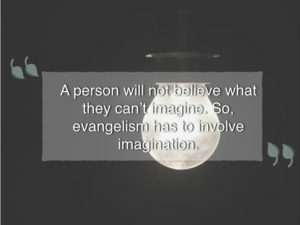 So, evangelism has to involve imagination. We have to use our “imaginal intelligence” (imagination) to help the unconverted imagine the reality of GOD, the goodness and love of GOD, the reality of Christ’s payment for our sin, and the benefits of confessing their sin and surrendering their life to HIM. That’s a big order. In fact, for evangelism to happen, a person MUST find their “imagination” (Imaginal intelligence) captured by GOD. They most positively “imagine” the goodness of GOD in Christ. They must imagine the reality of HIS Love for them. If that doesn’t occur then most likely evangelism probably won’t happen. That said, it’s important that Christ-followers then start acknowledging the importance of “imagination” – and the related expressions of imaginal intelligence: artistic and creative expressions, beauty, marvel and wonder – in our daily practice of evangelizing. First, most times the Hebrew or Greek terms for “imagination” are translated as such in the Bible “Imagination” is seen as vain imaginations – making something up that’s not true, but operating as if it is true (e.g. Neh. 6:8; Prov. 18:11; Jer. 23:16; Ez. 13:2; Acts 17:29; 2 Pet. 1:20). One might pull a positive, reality-based, dynamic of “imagination” out of Dan. 4:5 or 2 Cor. 2:9 – but frankly most don’t pay much attention to these passages. Second, the 71 (or so) times “imagination” or “to imagine” are used positively in the Old Testament (yatsar/yetser), the terms are translated “mind” (e.g. Is. 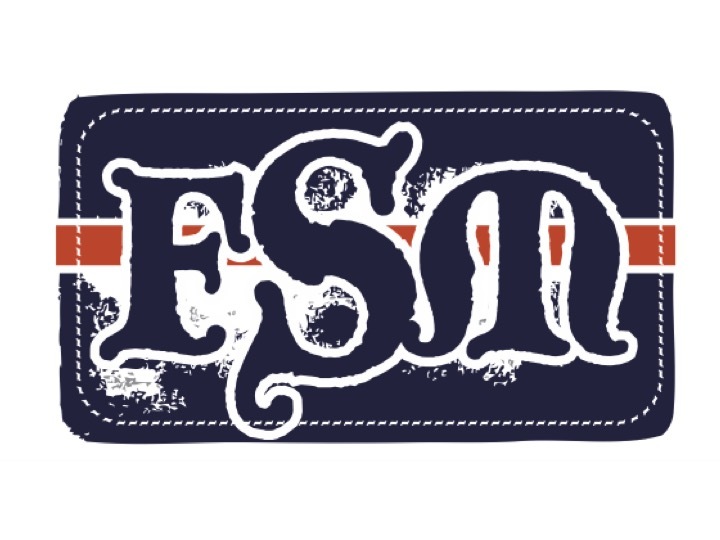 26:3), “fashion” (e.g. Is. 45:18b NIV), or “formed” (e.g. Is. 45:18c) – so we don’t actually get the real meaning of “imagination” GOD intended (of course this is my conviction). Third, Protestants have focused so much on the dynamic of “rational” propositions of biblical content (for many good reasons), we have overlooked the biblical revelation of the function and importance of the dynamic of our “imaginal” intelligence. This includes our faith and worship walk and our relating to others evangelistically. Given the above mentioned barriers to seeing and embracing our imagination, let me suggest three ways to hurdle these barriers. First, REMEMBER the way GOD used your “imaginal intelligence” – to engage you personally, lovingly, wonderfully, letting you “imagine” HIS goodness, HIS love for you, HIS forgiveness of your sins, and HIS release into HIS embrace? Think back over how you “imagined” the TRUTH of HIS existence, HIS care for you, the reality of HIS purposes for you, and such. That we have a spiritual inheritance given to us through Christ that will never perish (e.g. Without using your God-designed capacities of imagination there is no way to look into these realities and to “have faith” in these realities. You must use your “imaginal intelligence” or you will not deeply engage these realities. Third, RELEASE yourself REGULARLY, give yourself permission, to PRACTICE using your imagination to interact WITH GOD. If you don’t practice imagining into the REALITIES of GOD and the LIFE HE’s given us through the work of Christ and the deposit of HIS HOLY SPIRIT, we will not deeply develop the vast frontiers of our God-given imaginative intelligence. The more you “imagine” into the realities of GOD and HIS working in your life – all in line with His rationally revealed objective REVELATION, the Bible—the more HE will capture YOUR imagination. And, by extension, the more you will be able to help other’s imagination be captured by HIS supremacy, majesty, moral beauty, and HIS pursuing love in Christ for them as well. Remember, a person will not believe what they can’t imagine. 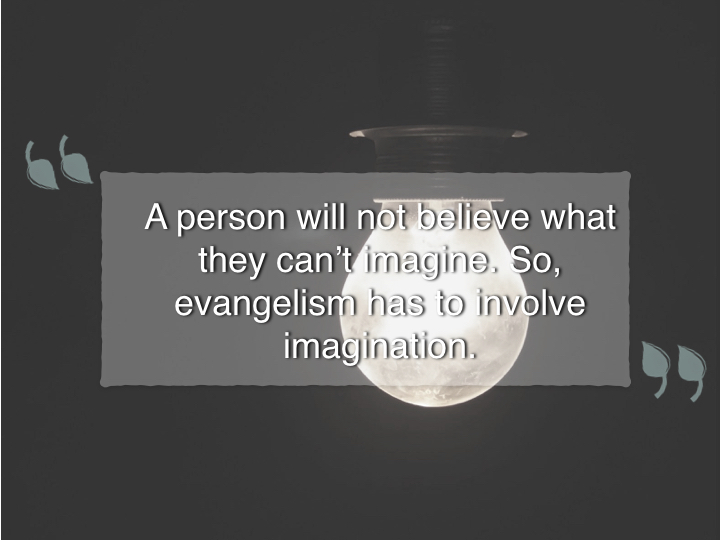 So, evangelism has to involve imagination. May you be encouraged by what GOD has revealed in Is. 26:3 “You will keep in perfect peace those whose “imaginations” are steadfastly focused on trusting in You.” (Author’s suggested translation).